The backing paper is from the old Artylicious "Filigree Fusions" CD and the image from a CD called "Victorian Ladies" that doesn't appear to have a brand name. I used a Marianne Creatables border die and a Spellbinders oval. Everything was edged with a very light touch of Tea Dye DI. I wanted to thread ribbon through the slots in the border, but had nothing in a suitable colour, so I dyed some white organza ribbon by dragging it over the surface of a Broken China DI pad. The pearl embellishments are from The Handcrafted Card company and the tiny butterflies were a gift from a friend. Before I move on to sharing this card, I'd like to share something else - the news that I've been chosen for the "Designer for a day" slot in the October 2015 issue of Quick Cards Made Easy: the card I made for it has already been shared on my blog. Beautiful card Jane lovely detailing. 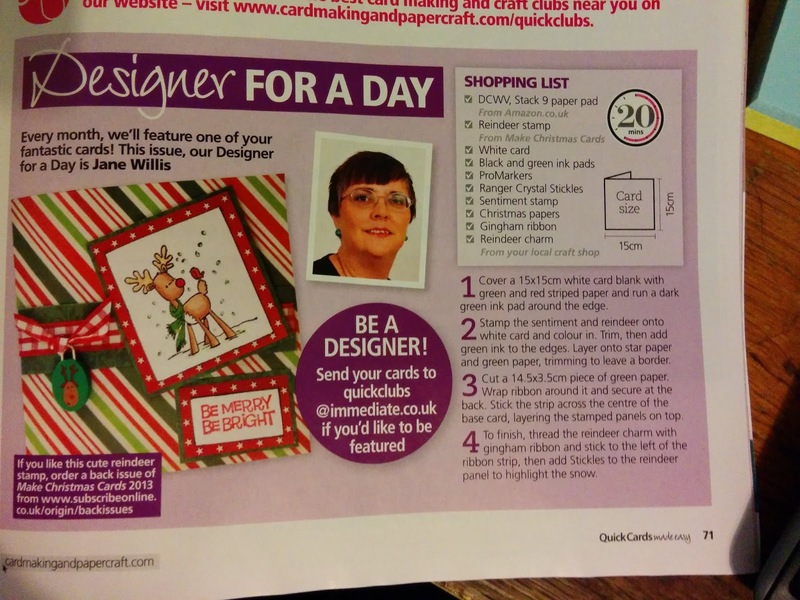 Congrats on being designer for a day too with another wonderful card, love that paper you used. What a lovely card and in this case definitely more is more! Thank you for sharing with us. love the vintage feel of your card the image is beautiful and your embellishments and layout have enhanced it beautifully. Beautiful layout , and no not too much for a vintage theme card, it's lovely, a good idea using DI, i just use my markers. Thanks for joining us at CD Sunday and well done on being chosen as designer for the day, well deserved . Congrats on being chosen as a Designer for the Day. Well deserved. Love your card - especially your bow. I am a sucker for bows. This is beautiful Jane, a gorgeous image and pretty blues - a fabulous card. Congratulations on being Designer for the Day.